Exercise benefits brain fitness. Have you ever felt energized after a brisk walk? Most of us have felt refreshed and energized even if a little physically tired right after a bit of exercise. Some of you have also felt more mentally alert. Why is that? In a important recent study by Dr. Kirk I. Erickson and colleagues from the Department of Psychology,University of Pittsburgh, his team may have provided some answers. Of course, we know that blood flow to the brain (hyperperfusion) with activity can help you feel more alert. But now we are learning that the parts of the brain involved with memory (hippocampal and medial temporal lobes) are larger in volume in adults who are more fit from exercise benefits. Further, this research indicates that exercise benefits physical activity training and increases hippocampal perfusion (more blood flow). Increasing your physical activity may help prevent vascular dementia, senile dementia or stroke that could cause memory loss. Dr. Erickson's study appeared in the Proceedings of the National Academy of Sciences on February 15, 2011. His report notes"these theoretically important findings indicate that *aerobic exercise* training is effective at reversing hippocampal volume loss in late adulthood, which is accompanied by improved memory function." Still another series of studies reported in Journal Watch Psychiatry in November 2010 also indicates that physical activity can be a key ingredient in brain health. The reports states that "exercise can improve cognitive performance, decrease biomarkers for Alzheimer disease, and increase gray-matter volume. Clearly, something is going on here that we need to pay attention to. 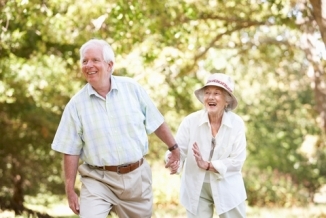 The National Institute of Aging (NIA) has long said that physical activity is good for you. That seems like common sense. However, they have reported that staying active can help you improve balance, reduce depression, provide greater energy and foster longer independence due to improved strength. How much physical activity is needed? The NIA recommends that you start low and go slow. This is always good advice. Specifically, they recommend that you build up over time to 30 minutes of activity most days of the week. The activity that you chose should cause you to breathe a little harder. Of course, if you can work out everyday that is best. You may wish to start with every other day. They point out that if you can speak without trouble it is not hard enough. BUT... if you can't talk at all your are doing too much. IMPORTANT: If you are over the age of 50 and not accustomed to a brisk work out, talk with your physician before you begin. Many physicians have pamphlets in their office about the value and cautions associated with increased physical activity. Don't be afraid to ask. Where can I work out? Simply taking a brisk walk in your neighborhood may work. Many local indoor shopping malls encourage seniors to use their facilities in the morning to walk about. A recent study in the Archives of Neurology indicates that a brisk walk for 30 minutes five times per week can be protective from developing Alzheimer's disease. You also may find that riding a bike will work for you. Make it a social activity. Get together with a few friends. Even working out with one other person can make it more fun! There are many aerobic videos available that you can use at home to give you that extra bit of guidance and motivation. Helpful: Many people find working out can be a social activity as well. Interacting with others can also prevent memory loss. Gardening can be safe. Also, some smart seniors do arm lifts with two one pound cans of vegetables from their kitchen to get started. Swimming can be an especially fun activity. Being in a pool is easier on your joints and may be a great way to start. Many local YMCA's have special programs for seniors. FACT: Senior citizens 65 and older now represent the fastest-growing category of YMCA membership. So... report dizziness or shortness of breath, chest pain or pressure, racing or fluttering heart, unplanned weight loss, sores that don't heal, etc. BOTTOM LINE: Any activity is better than no activity. 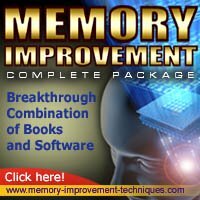 So get started today and reduce memory loss!